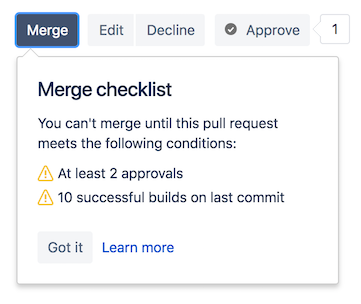 We'd like to be able to override the default behavior of the "Merge" button on pull requests -- specifically, we'd like to be able to disable/gray it out by default, and enable it only when various automated tests have run. Currently the button is active even when merges are impossible due to merge checks. As a result, we don't plan to add an API to accomplish the same behavior.